Creative Italian food in a converted monastery that gives the party side of dining a wholesale embrace. It’s Bacchic. You can eat while lying on enormous white sofas and enjoying lounge music, video and performance art. Rome’s black aristocracy kids love it here: So much wealth but nothing to do. Still, it’s fun if you’re up to it. 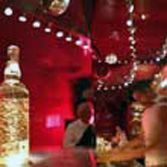 Operated by a young and creative staff, the Rome Supperclub follows on the heels of success in Amsterdam (now San Francisco and Istanbul). Condé Nast-Traveller has called it an “innovative and unusual combination of food, unique multi sensory and eclectic atmosphere.” Five course prix-fix dinners don’t include drinks. It’s in an alleyway, so don’t be discouraged. Closed Wednesday, but only for dinner.